The kitchen is a mess. The family is up, eating breakfast, and spilling their food. 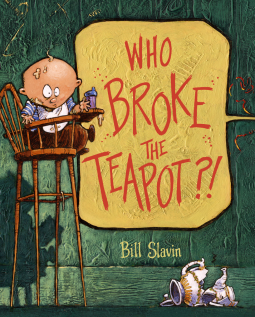 But what really sets Mom off is the fact that her favorite teapot has fallen off the shelf and broken! Tundra Books and Net Galley let me read this book for review (thank you). It has been published, so you can grab a copy now. The two page spreads of Mom being angry and shouting are great illustrations. You can SEE her shout and yell about the teapot. When she questions them, they all deny touching it. They did lots of other bad things but not that. This story has a nice little twist in it I didn't see coming and I like it.